That March morning the school library was warm and smelled of cedar, beeswax. Weeks of anticipation–“When will they arrive?”–culminated. As two students and I approach the covered case, one student hyperventilates. “It’s ok,” I say. “The bees are behind glass.” We speak in hushed tones, overcome by rhythmic buzzing. I lift the cloth cover and we three exhale: ten-thousand pairs of wings shimmer on striped bodies. 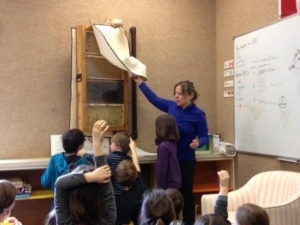 In collaboration with Galiano Community School Principal Shannon Johnston, staff, teachers, and local beekeeper Brad Lockett, the Food Program received a grant from BeeCause.org and Whole Kids Foundation for an observation honeybee hive. The goal of BeeCause.org is to raise a generation of kids who love bees and respect the role they play in our ecosystem and food chain. BeeCause hopes to install 1000 hives in schools. Our school was the first and only, so far, in Canada to receive such an observation hive. To date, 174 other schools in the US, Haiti and the Bahamas have received hives. Our school has embraced the bees. Now that the kids have experienced how gentle the bees are the initial fear has evaporated. Together, everyone’s been learning. “A bee only makes 1/12 of a teaspoon of honey in its entire life,” states Sophia. Dylan notes: “To make honey, bees regurgitate nectar from one of their stomachs…” The bees pass nectar from bee to bee until the desired consistency and water content are reached. The flavour of honey reflects the local pollinated flora. “Our” bees access the outdoors through a tube drilled through the school wall. From outside, the hole sits three and half metres from the ground and looks like a bird house. A bee exits the tube and flies across the playground carrying another bee. “She’s removing the dead,” says Claire. “The girl bees do all the work!” exclaims Shekayah with a hint of indignation. It’s recess and the playground is filled with a cacophony only children can make: running, watching Leo the Lizard in the sand box. Meanwhile, honey bees fly overhead, an image of how things should be; all right in the world. “Maybe we should check on the bees today,” suggests Finn. He means from inside the school library, to observe them through the case. I explain that we’re going to leave the bees quiet and dark to allow the queen to build up her brood. For now, we’ll watch them outside in the school garden, enjoying the blue flowers of borage, the asparagus that’s been allowed to bloom and the raspberry flowers that are appearing. The pear tree, we notice, has a particularly good fruit set this year. We have thousands of new friends to thank for this. Join us for the 91st Annual General Meeting of the Galiano Club on May 28th at 2:30 p.m. There will be the regular business meeting highlighting the past year’s activities followed by a short presentation on “Planned Giving and Benefitting Local Charities”. The meeting will end with complimentary ice cream sundaes topped with blackberry, butterscotch or chocolate sauces (or all 3). Everyone, whether a member or not, is welcome. Hope to see you there!